And so, we enter the final phase of the season. Arsenal will play at least 13 more matches this season, 14 if they defeat Manchester City at Wembley in the FA Cup Semi-Final. They still have a dozen league fixtures on the docket, but the European portion of this campaign is over and, hopefully, buried like it's radioactive or something. The movement of domestic fixtures won't ease their fixture congestion, however. Their matches against Southampton and Leicester City have not yet been rescheduled and their FA Cup Semi-Final will mean movement of the scheduled fixture against Sunderland that weekend as well. With their league campaign coming squarely into focus, Arsenal have to start taking maximum points from their games against mid-table and lower opposition (and, ideally, all of them, but let's not get greedy.) There's an international break on the horizon before Arsenal host Manchester City on April 2. This is Arsenal's only match between now and then and it comes against a West Brom side that might not have much motivation, as they sit comfortably mid-table. Arsenal lost at the Hawthorns last season, a sign of worse to come. They cannot afford to drop points there this time around, lest their fifth place standing in the table become permanent. Alex Oxlade-Chamberlain left last week's FA Cup tie against Lincoln City on 27 minutes with a hamstring problem, one which leaves him a doubt for this week's trip to West Brom, rather than out entirely. Danny Welbeck missed out last weekend through illness and David Ospina missed out through a groin tweak; it sounds like both of them are available again, but Kieran Gibbs is a doubt, as he's carrying a knock of some sort. Mohamed Elneny is back in training again after his ankle had been in a boot, but I would guess that he'll be too short of fitness for this match. Predicted XI: Čech, Bellerín, Koscielny, Mustafi, Monreal, Xhaka, Ramsey, Iwobi, Walcott, Özil, Alexis. Not much to say here; Matt Phillips is a 50/50 doubt with a knock and everyone else in West Brom's squad is available. Tony Pulis's actual player selection, however, leaves a little more to be discussed. Last weekend, the Baggies went to Goodison Park with the opportunity to gain some ground on Everton, who are directly ahead of them in the table. For the match, Pulis made three changes to the side that had lost to Crystal Palace the week prior, dropping James Morrison, Chris Bunt, and Salomon Rondón in exchange for Claudio Yacob, James McClean, and Hal Robson-Kanu. It didn't work, as Albion lost 3-0. As such, all three could find their way back into Pulis's XI for this match. Predicted XI: Foster, Dawson, McAuley, Evans, Nyom, Fletcher, Livermore, Brunt, Chadli, Morrison, Rondón. If you exclude cup ties against non-league clubs, then Arsenal have only one win (over Hull City) in their last six matches, having lost the other five against Bayern twice, Watford, Chelsea, and Liverpool. Then again, you can't fault Arsenal for having been drawn against Sutton and Lincoln in the FA Cup and they won those matches, so what else do you want them to do? Even still, cup ties have forced the postponement of two of Arsenal's league fixtures, against Southampton and Leicester, meaning the Gunners have played one or two fewer league games than the clubs around them. As such, they are fifth in the table, five points back of fourth place Liverpool, but with two games in hand. Win them, and Arsenal are fourth again. They have a single game in hand on Spurs and City as well, but they are six points back of those clubs. Keep in mind that Arsenal will still play both of them, however. Meanwhile, did you know West Brom are in eighth? Would you believe they've also been in eighth since New Year's? You might have known this because the Baggies were in seventh when they went to the Emirates on Boxing Day. Then again, for a lot of people, all of the mid-table clubs kinda blend together after a while. If you're not in the title race and you're not in danger of relegation, then who knows where you are in the table? It's like, Premier League limbo. West Brom have 40 points, meaning they are seven points back of Everton for seventh and four points clear of Stoke, who are in ninth. So you can see why they've been in eighth for over two months. The Baggies recently lost their chance at gaining ground on the Toffees, as they lost 3-0 at Goodison Park at the weekend. West Brom are winless against the seven clubs ahead of them in the table, only picking up a point against Spurs at the Hawthorns in October. Arsenal will hope that stat maintains itself this weekend. Arsenal huffed and puffed and eventually found a winner against West Brom in the reverse fixture at the Emirates on Boxing Day. Coming into the match, Arsenal had lost consecutive league fixtures against Everton and Manchester City, so they desperately needed all three points. Still, they found it hard to break down a well-drilled West Brom defense that, for obvious reasons, came to the Emirates to stifle. Olivier Giroud, making his first league start of the season, nodded a Mesut Özil cross past Ben Foster in the 86th minute to give the Gunners a very difficult three points. Ben Foster made 10 saves in the loss. In this corresponding fixture last season, Arsenal lost 2-1; it was their first loss against the Baggies in 10 games. Mikel Arteta came on for the injured Francis Coquelin on 14 minutes and Arsenal struck first through Olivier Giroud after 28 minutes. West Brom equalized from a set piece just seven minutes later, then led through an Arteta own goal five minutes after that. To add injury to insult, Arteta was removed on 49 minutes, and then to add insult to injury to insult, Santi Cazorla skied a late penalty that would've stolen Arsenal a point. Arsenal have not always been successful at the Hawthorns since West Brom's most recent promotion back in 2010. The Gunners have four wins in seven trips to West Brom since then, though one of the wins was in a League Cup penalty shootout. 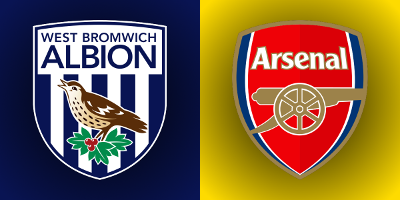 Last year's match was Arsenal's first loss at the Hawthorns since 2005. The referee is Lancashire-based Neil Swarbrick. Arsenal have only seen Swarbrick once so far this season and, in a bit of a quirk, it was for the reverse fixture on Boxing Day. Even stranger, Arsenal didn't have Swarbrick at all last season, so you'd have to go back to December 28, 2014 to find the last time, before Boxing Day, that Arsenal had him as their referee; that was a 2-1 win at West Ham. Arsenal have never lost a match with Swarbrick in charge; they have now won six of them and drawn one, so maybe we should be hoping to see him more often? The draw was a 0-0 at Everton in April of 2013; I remember this match distinctly because it was a midweek fixture while I was on vacation in Montreal. I recall he had completely lost control of the match. West Brom have not had Swarbrick since the Boxing Day match either, but had him twice this season before that. Both were one goal losses to clubs from Liverpool. They lost 2-1 at home to Everton in August and 2-1 at Anfield in October. John Painting is a contributing writer to the Modern Gooner and a public park. You can follow him on Twitter @zorrocat for beautiful trees and breathtaking vistas.